3. What is best, Iberian Ham or Iberian Shoulder? 4. What Iberian ham is better, the one from the right rear leg or the left one? 5. Iberian pigs that produce Iberian acorn hams, do they always eat acorn? 6. What is the meaning of “Pata Negra”? 7. How much ham is in an Iberian ham? And in an Iberian shoulder? 8. How much time does it take the maturation process of an Iberian ham? 10. What are the white spots the sometimes appear in Iberian ham meat? 11. How to best preserve the Iberian ham once you have started it? The authentic Iberian ham from Iberian pigs has long and slender legs. Besides this characteristic, if both sides of the hoof have the same length and there is a little space between them is a synonym of that the Iberian pig has been eating acorns and living in freedom in the dehesa. If you press with your fingers the Iberian external fat of the ham and your fingerprint in remains in it for some seconds, this ham is an acorn fed Iberian ham. If exterior fat has a yellowish colour is due the long drying period and maturation. 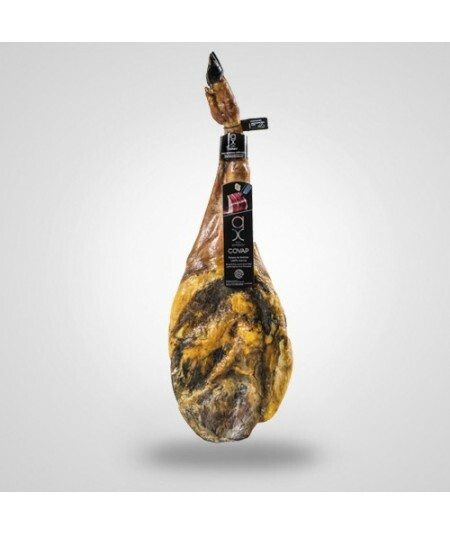 We, at http://jamonypico.com/en/ are 100% focused on the Iberian ham, obtained from Iberian pigs, which are pigs with a black or dark skin, that due to their specific genetics, its wheat is deposited between their muscles, increasing its incredible taste. Iberian Cebo-ham: Pigs diet is based on grain and cereals, but also includes aromatic grasses from the fields. Iberian Recebo ham: acorn is included in the diet of these the Iberian pigs, as a supplement. Iberian acorn ham: Iberian pigs are mainly fed with acorn which they eat while they live in freedom in the Iberian fields called “Dehesa”. These are high quality hams. Denominación de Origen Iberian Acorn ham, these are simply the top high quality hams available in the market. These hams come from specifically selected Iberian pigs which have the same diet than the previous type, but due to such exclusive pig selection, their taste, smell and properties are the very best in class. Besides this ham classification, we should also aware our international clients about the utilization of the term “Pata Negra”, this is the most common expression used to describe the Iberian acorn hams, but is not fully accurate, because not all the Iberian acorn hams have a black hoof and not all the black hoof hams come from acorn fed pigs. In recent months the Minister of Agriculture and Nutrition of Spain is working on a new law to classify all hams in just six categories based on pig´s race and their diet. Both, ham and shoulder are obtained from Iberian pigs, and all the processes to obtain them are identical. There could be a slight difference in terms of timings at drying or maturation processes. Iberian ham are obtained from rear legs of the pigs, while shoulders are obtained from front legs, as a result, Iberian hams weight is around 6 to 8 kilos, while Iberian shoulder´s weight is between 4 and 6 kilos. Besides this, Iberian hams have a much longer and thinner appearance, while shoulders have a rounded shape. On top of, Iberian hams have less external and internal fat which has an impact in its taste and flavor. Visit now www.jamonypico.com and discover our offer in Iberian ham and Iberian shoulders, in pieces and in hand-sliced products and for sure you will make the right decision. Some people think that Iberian pigs usually rest always laying over the same leg and this makes a difference in term of taste and flavor, but this is not true. Pigs rest laying on both left or right rear leg and hams of both legs have the same quality and taste. This is the most common expression used to describe the Iberian acorn hams, but is not fully accurate, because not all the Iberian acorn hams have a black hoof and not all the black hoof hams come from acorn fed pigs. Maturation process depends on the weight of the ham, humidity and temperature of the place where the maturation takes place, but on average is around 30 months. Depending on the time you expect to eat your ham you will trim it in different ways. If you think that you will eat it in a mid-long term period, you should start slicing it from the narrow end or “contramaza”, this requires that the ham has to be trimmed with the hoof pointing down. If you expect to eat our Iberian ham in a period up to 3 days, you should trim the ham in the ham holder in the opposite way, with the hoof pointing up. Once you have trimmed the ham, with a sharp, short and wide knife you should take out the ham skin and the first yellow fat layer. This fat layers cut will be used to protect the cut areas and won´t let dry the ham. 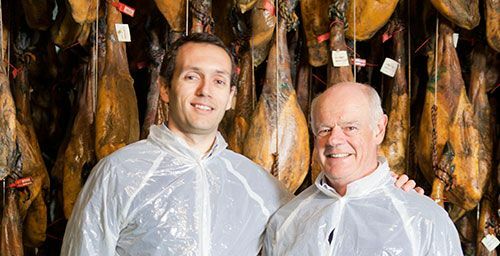 To make our clients life much easier and to ease you to enjoy the Iberian ham we offer you Iberian ham and Iberian shoulder of hand-sliced packs, always sliced by our experts’ ham artisans. Sometimes you can notice that there are some White spots in Iberian ham meat. This white spots are produced during maturation process, they are not a failure of the ham, they are simply amino acids accumulation and are totally edible. To best preserve an Iberian ham you should place it in a fresh and dry environment. Once you have started it, you should cover the meat with the fat you previously took off to produce the ham slices. This fat will help to preserve the flavor and taste of your ham until you finish it. If you bought packages of ham in slices you better preserve them in the fridge until you plan to eat it. We recommend you to open the packages 15 minutes before eating them in order to allow the ham to reach the optimum temperature to eat it. We invite you to discover our offer of Iberian ham in pieces or in hand-sliced packages and share with us your thoughts and opinions.